Be a part of NLP in a Week! Experience seven unforgettable days that will push you forward into your own personal growth. NLP in a week is a fast, thought provoking and mind changing NLP Seminar. Normally an NLP quality training of this level would cost a small fortune. Register soon and you can participate for only 435 pounds. Experience enhanced NLP in a Back to Roots style, natural, down to Earth, entertaining but at the same time open and honest. A life changing experience for a low price. Spellbinding content: You learn the basics of NLP as well as the latest evolvements and enhancements. You use all techniques on yourself and others. NLP is an effective tool for personal growth and at the same time can be utilized to increase your depth and understanding of communication. The results are phenomenal..
An investment for the future: This training is one of the best investments you can make for your future. Develop your personality and learn to set goals of clarity and master challenges. The methods you will learn can be utilized in your private and professional lives. There are not many better ways to invest in a consistent and effective self improvement process. Compact and intensive The training runs over 7 days with roughly 60 hours of continual training. We start at 10 am and end at around 6pm. On certain days we offer you an extra evening session (no extra cost) with exciting themes or social events. Lots of fun! We promise you that there will be lots of laughing during the training. You will have tons of fun and joy together with the other participants. Many of the teaching units are enriched with exceptional and educational metaphors and stories. It is uplifting to listen to and experience Landsiedel NLP trainers and at the same time learn more about yourself and how to change negative thought patterns. 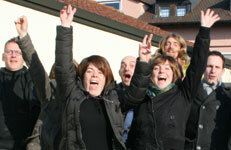 NLP in a week presents the best modules of the NLP Practitioner and NLP Master Trainings. It is short, compact and one of a kind. Naturally we cannot cover all of the themes contained in the NLP box of mind-changing tools. For a lot of people this one week is perfect, to be able to dive into the world of NLP and to win a new impulse for their personal and professional lives. NLP basics: You learn the NLP basic skills and practise these together with your fellow participants. Your self confidence and charisma will increase and your relationship to others will become clearer and deeper. Communication is one of the key skills in our everyday life and NLP is one of the most powerful communication methods. Methods of change: Here you will learn some of the most important NLP- change processes for personal growth. e.g. Achors, Reframing, Sub-modalities, Time-Line, Rapport, Change-History and much more. Some of these techniques will be introduced into England for the first time. This seminar is a hands-on experience where you will experience the effects within yourself and at the same time be able to work with others. All methods are easy and understandable based on intuition and logical simplicity. Increase your health: Learn about the hidden meaning and subconscious messages behind illness and pain. The trainer has over 35 years of experience in health and how to stay healthy. Values and Belief statements: Change your mind and your personal values and you change your life. What are your thoughts about, Love, Joy, Money and success? You will learn how to change limiting belief statements into powerful states of motivation. Goal achieving and Life-Design: Become the creator of your own life and prepare the path for a brilliant future. What kind of person do you want to become in the future? Who are you really, when you were able to release all of your possible potential. How would your life change when you only did that what you had always dreamed of doing. Energy and state management: Learn how to achieve more confidence and personal power. Develop more positive belief systems and energy in your life. Be more outgoing, creative and passionate. NLP in a week is based on respect and integrity for the reality and belief systems of all participants. We believe that change can only take place within a state of honesty, trust and openness towards our clients. We are sorry, there ist no course availabe at the moment! Overview: Ray Wilkins has more than 30 years of experience and training in NLP, Personal Growth and Clinical Hypnosis. As well as that, he is a specialist in discovering the psychological causes behind illness and Traditional Chinese Medicine. He believes that feelings and emotions are the key to the powers of self-healing and health. More Details: Ray Wilkins has been practising NLP for over 30 years, he was one of the first NLP-trainers in Europe trained by Gundl Kutschera, Austria. He sometimes shares that one of the main influences in his life as a coach was the contact that he had to the Australian aborigines when he was growing up. It is sometimes thought that the aborigines have the power of telepathy but Ray Wilkins says that it is all about body language, micro- facial-mimics and congruency. He started his work with people when he was 16 working as a nursing aide then completing a 4 year graduate nursing training in Canberra Australia. He then travelled overseas working in the UK, Germany, Austria, Switzerland and Belgium. He specialised in advanced intensive care, anaesthetics and Haemodialysis. In his 13 years of working in hospitals he realised that there was a lot more involved in a healing process than just rest, medications, treatments etc. He began to study alternative healing methods including Rebirthing, Gestalt-therapy, Kinesiologie, Focussing, Shiatsu, Macrobiotics, Traditional Chinese Medicine and NLP. In 1985 he opened his first therapeutic practise for alternative medicine and psychotherapy in Wiesbaden, Germany. In 1987 he opened together with Cordula Ehms the People and Art factory over the next 25 years he trained NLP Practitioners, Masters and Trainers as well as running an NLP health Coach programm. Ray believes in the power of self-healing and that behind every illness there is always a ositive intention. Another belief that influences the way he works is that feelings and emotions are the key to our inner healer or subconsciousness enabling us to develop our intuition, self growth and personal power. His trainings, seminars and presentations are based on reality and that what the participants/students need at that time because of this he seldom does any power point presentations, or hand-outs. His trainings are unique because he believes that the only way to understand NLP is by doing. Because of this the self development process or changing personal negative belief systems is for him much more important than being able to illicit a perfect NLP technique. Ray has trained people in business, teams, nursing institutes, hospitals, schools d universities. He is sometimes referred to as the "NLP hermit with insight" because as he says himself, after completing his 5 years of NLP training he developed his own style and methods uninfluenced by any other trainers or NLP developers of his time, his teachers being his clients and students. Ray Wilkins is also an internationally renowned professional artist, writes novels combining the beliefs of the Australian Aborigines, self growth and NLP and turning this knowledge into captivating stories, he is also a professional songwriter. Ray is known to be provocative and challenging in the way he works. He does not accept compromisses or clients not believing that they deserve the very best. He has three children Marc R Wilkins Film director based in New York, Luke J Wilkins Actor and professional musician based in Biel, Switzerland and Sarah Wilkins psychologist and Yoga trainer living in Berlin. He has a typical Australian sense of humour and believes in the power of love. His latest project is together with landsiedel Training to introduce "NLP for everybody" into the UK. NLP with depth, NLP with respect, NLP where personal growth is much more important than playing a part. NLP for YOU. Anybody can participate in NLP in a week. It is not necessary to have any previous experiences or knowledge, just be open and curious. This programm is designed for people who want to stretch their personal possibilities to the limit, people who think �out of the box,� who are eager to learn and want to belong to that generation that makes a change in this world. 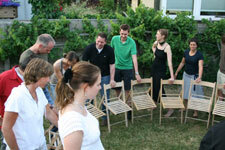 This programm is ideal for future management candidates, coaches and other people who work with people e.g. social workers, therapists, teachers, consultants etc. many companies in Germany, Switzerland and Austria and self employed attend personally or send their co-workers to NLP in a week trainings, to tank up on energy, personal growth, health and to develop new innovative and creative ideas. Save a lot of money by becoming a super-early-bird booker.